Ronnie McFall with the Irish Cup following Portadown's 2005 victory over Larne. 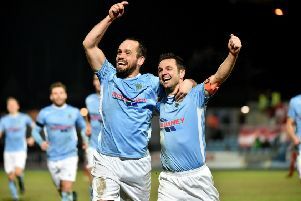 Ronnie McFall is backing the final fanbase to turn out in force tomorrow (Saturday) and support the Ports as the veteran boss attempts to mastermind Irish Cup glory on Glentoran’s home patch. McFall has led his hometown club to the domestic game’s showpiece stage on seven previous occasions and will emphasise the need to play the match, not the occasion. His desire to ignore the hype, however, does not extend to the Glentoran camp as McFall is adamant the Belfast side will benefit from a string of advantages this weekend. “In any cup draw you just want home advantage and Glentoran have been given that for Saturday,” said McFall. “It is the biggest day of the football season and I think the pressure is all on Glentoran under the circumstances. “I have been reading some of the comments by Glentoran manager Eddie Patterson and he seems a bit edgy. “They have home advantage and a larger ticket allocation but I am backing our players to approach the game as normal and I know our fans will help us tilt the balance. “Our supporters created a brilliant atmosphere at The Oval for the semi-final and the final is a day when everyone wants to get out and back the club and represent the town. McFall can point to a full squad leading up to the most important team selection of his season as Portadown attempt to win the Irish Cup for the first time since 2005 - plus benefit from the European qualification and financial windfall. “We need to ignore the hype around the game and trust in our normal routine,” said the Ports boss. “The gameplan is to approach training as usual this week and having an injury-free group gives us the best opportunity. “You only have to look at how Shea Conaty stepped in with just a few minutes’ notice in the semi-final to see how superb the young lads have been this season. “Everyone is determined to get the trophy and we all want gold medals, not silver.